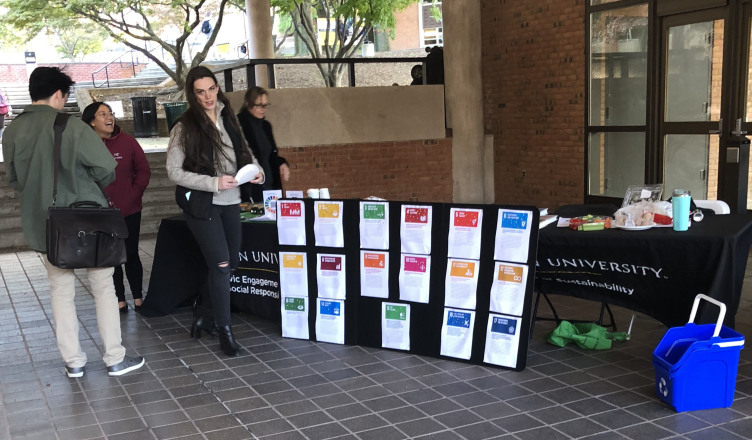 Towson students had the opportunity to learn what the university is doing to make campus more environmentally friendly last Wednesday at the Climate Action Plan Forum. As a part of Sustainability Month, Eco-Reps from Civic Engagement and Social Responsibility and The Office of Sustainability held the Forum in Freedom Square, where they manned a table. In front of the table, there was a board with 17 pieces of paper attached to it. On each of these papers, were Towson’s 17 goals to promote a more eco-friendly and healthy planet, including goals like affordable and clean energy and clean water and sanitation. The idea for the forum was to allow students to learn more about Towson’s green initiatives, and place a pin on the goal they believed was the most important. Ober said Towson has “Green Roofs” around campus to promote cleaner water drainage and get rid of pollutants. Towson is also home to nine buildings that have been deemed gold or silver certified by the Leadership in Energy and Environmental Design. Five of those buildings are equipped with solar panels and many more have space available to add them when ready, Ober said. Emily Sexton, a graduate student pursuing her master’s in environmental science, helped the Office of Sustainability by persuading students passing by to put a pin in the board. Yakob Tirfe, a senior mass communications Public Relations major put a pin in the board. “I wanted to see all the different things Towson is doing, and it all looks really cool,” Tirfe said. Another student, James Tamayo, expressed a lot of interest after being persuaded to participate.